Compulab has announced its new fitlet2 ultra-compact PC designed for a broad range of applications, including office, IoT and industrial. The Compulab fitlet2 is a small unit, cooled passively using its own chassis made of die-cast metal. The system supports Compulab’s function and connectivity extension T-cards (FACET cards) that add functionality, such as extra GbE or USB ports, or even a 4G modem. The Compulab fitlet2 measures 112 mm by 84 mm, meaning that it is smaller than Intel’s NUCs and other UCFF-class PCs. Depending on exact model, the Compulab fitlet2 can be based on Intel’s Atom x7-E3950, Atom x5-E3930 or a Celeron J3455, all based on Intel's Apollo Lake cores. The motherboard of the system features one SO-DIMM slot for up to 16 GB og DDR3L-1866 memory. As for storage options, the mainboard supports M.2-2260/2242 SSDs, modular M.2 eMMC drives as well as 2.5” SATA storage solutions. One M.2 module and one 2.5" drive can be installed at the same time. By default, the Compulab fitlet2 system comes with two GbE ports, two USB 3.0 connectors, two USB 2.0 headers, a COM port, audio jacks, a microSD slot, an HDMI 1.4, and an mDP 1.2 output. Users can install one of Compulab’s FACET cards to get other connectivity features, including (but not limited to) a 802.11ac Wi-Fi + Bluetooth 4.2 module, a 4G modem, two extra GbE ports, four additional USB headers, or an M.2 E-key slot. Compulab keeps the FACET spec open so interested parties can develop their own cards to extend I/O capabilities and address certain needs, such as FPGAs perhaps. 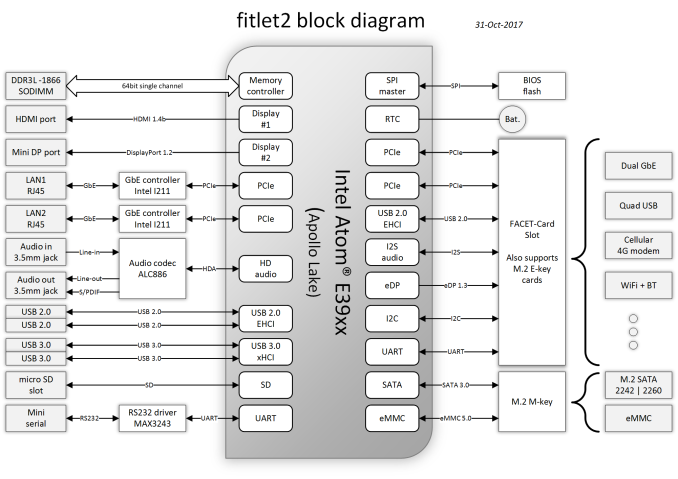 One thing that should be kept in mind is that Apollo Lake SoCs only support PCIe 2.0, so the fitlet2 will not be able to take advantage of fast I/O or modern SSDs. 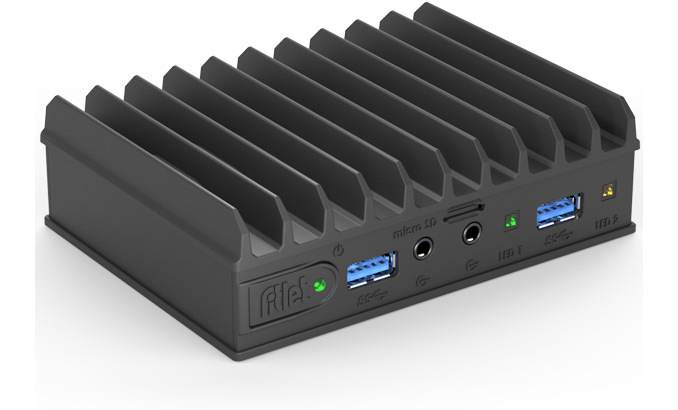 As mentioned above, the fitlet2 can be adapted for various applications and for this reason different versions of the PC will use slightly different enclosures. The low power models use 112 mm by 84 mm housing that is 25mm thick, while a higher performance SKU is 34 mm thick (to dissipate more heat), and industrial designs come in a 112x112x25 mm chassis because of mounting mechanisms. All versions of the fitlet2 are rated to operate in rather extreme environments with temperatures between -40°C and 85°C and humidity between 5% and 95% (non-condensing). 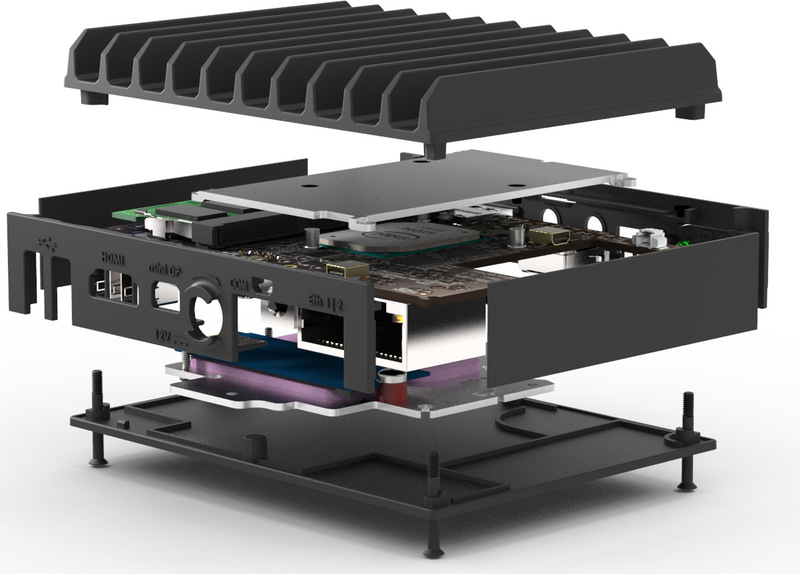 Because the fitlet2 enables to build systems featuring different specifications, Compulab does not announce exact MSRPs for all the units, possibly because 99% of such PCs will be built-to-order (the manufacturer even offers color customization for large customers). The cheapest fitlet2 is available for $153, but once it is equipped according to requirements, its price will be considerably higher (keep in mind that industrial DIMMs and SSDs rated for extended temperatures cost more than consumer-class components). All fitlet2 computers are covered by a five-year warranty and are guaranteed to be available for 15 years. Actually the design it is based on a real Compulab product.